Proud Recipients of the 2016 AND 2017 Plattsburgh Press Republican Reader's Choice Award! 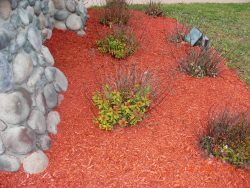 Rand Hill Lawns, Inc.has been providing residential & commercial landscaping and snow removal services for over 30 years! Specializing in commercial/residential snow removal and treatment. Rand Hill Lawns, Inc. is the go-to lawn care provider and landscape service in Chazy, NY! From general lawn care maintenance to complete landscaping, excavating, paving, fertilizing and more, we do it all to keep your property looking its best. Contact us today for a free estimate on service for your residential or commercial property. Landscaping in Chazy, NY is a lot of work. Often, homeowners and commercial property managers don’t have time to keep up with it all. This leads to all sorts of problems, including overgrowth and a cluttered landscape look. For prim and pristine maintenance, as well as customized landscape solutions, Rand Hill Lawns, Inc. is the smart and easy answer. We tend to your lawn and landscape so you don’t have to! Our team works hard to ensure every blade of grass, every tree and every shrub look their best at all times, presenting a vision of perfection for your home or business. More than just maintenance, our landscapers in Chazy, NY can also tackle complete landscape renovations. From excavation and terraforming to planting and trimming, we’ll correct a disheveled landscape and turn it into something you’ll be proud to show off! We even offer specialty services like paving and hydroseeding in Chazy, NY, to go the distance for our customers. We’re not just summertime contractors either! Call on us for year-round services, including snow removal in the winter months. To see what we can do for your property, get in touch with us today. No matter the size or scope of your landscaping needs, you can rest assured they’re in the best, most capable hands when our team is on the job. We’ve been in business since 1986 and have a professional team that’s back by more than 30 years of experience! Our services are available to residential and commercial properties of all sizes. We are a fully licensed pesticide applicator. We offer year-round services to help keep your lawn and landscape looking pristine. We offer free estimates to all customers seeking lawn and landscape services. For prim hedges, a pristine lawn, beautiful paving and more, Rand Hill Lawns, Inc. is here to help! Contact us today for a quote on lawn and landscape services for your home or business.